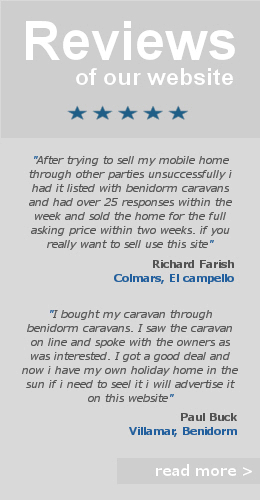 Resale Mobile Homes For sale In Spain- Benidorm. SOLD SOLD SOLD!! Unique Aitana Resale Park Home For Sale On Camping Almafra Caravan Park In Benidorm, Costa Blanca, Spain. Everything Is Included In This Sale. This is an extra wide 2 bedroom Park Home and the only one of it’s kind on Camping Almafra. The recently refurbished home is situated on a large fenced plot, with a private garden to the side. This model comes with Upvc double glazing & underfloor insulation. Modern fixtures & fittings. Tiled floor throughout. Recently installed Gas boiler. The living room & dining area are located at the front of the home and comes with wall mounted flat screen TV, Sky TV, media unit, brown leather 3 + 1 recliners, dining table & 4 chairs. Air-conditioning unit installed. The Kitchen is modern and comes fully equipped with Fridge freezer, Microwave, electric Oven & hob with extractor. The bedrooms are larger than average. The master bedroom comes with a new king-size bed with lift-up storage underneath, flat screen TV with Sky TV & bedroom furniture. The 2nd double bedroom comes with a double bed & bedroom furniture included. The spacious Bathroom is equipped with full size bath/shower, WC & sink. The exterior has been well designed to create fully use-able spaces. There is a decked area to the front with bistro table & chairs. To the side of the home is a good sized low maintenance garden area finished with artificial grass. There is a large utility shed at the rear of the garden with plumbed washing machine. Interested In This Park Home? Contact The Seller Directly By Filling Out The Contact Form Below.. 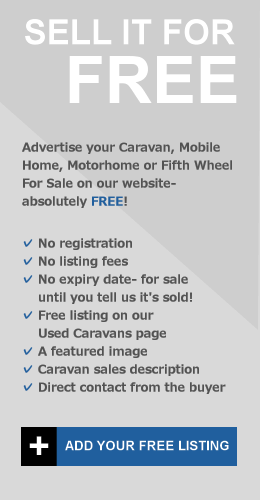 Camping Almafra Caravan sales; Costa Blanca Park Homes; Residential Park Home Sites In Spain.